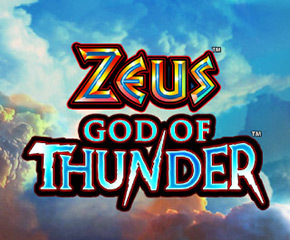 Zeus God of Thunder is a slot game with a Greek mythological theme with a majestic Citadel and clouds with thunderbolts. The power of Zeus can be experienced in this game with stunning graphics. There are five reels with four rows and 30 paylines that help you win from various symbol combinations. The reels are set with dark purple clouds with sounds of thunder. There is an epic music to make the theme look more realistic and intense. There are two betting limits; one with an extra bet and another without activating it. The extra bet has a limit of 75p to £75 and without an extra bet, you can bet with 50p to £50 a spin. This mythological themed slot game was developed by none other than Scientific Games. One of the world’s largest game developers with over two decades of experience in the online casino industry. They create games for both desktop and mobile users so you can gamble while on the move. 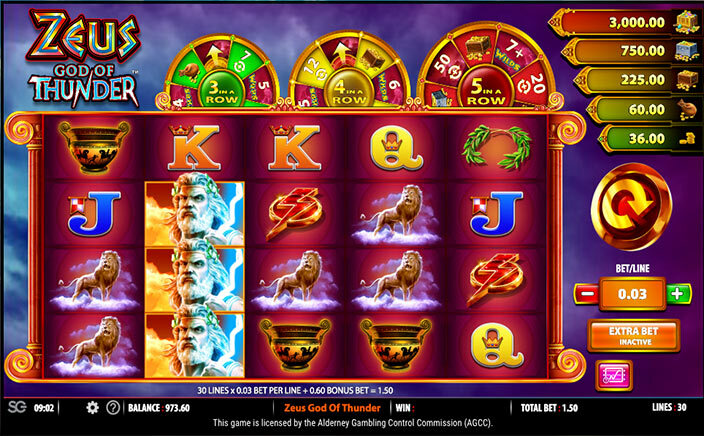 The symbols of Zeus God of Thunder slots consist of Zeus, a lion, an eagle, vase, wreath and lightning. The one that gives you the highest value reward is Zeus with 2.5 times on your total bet value. The low payout symbols of this game are card symbols. The jack, queen, ace and king pay you 0.50 times on your bet with five of a kind win. All wins on the reels are considered left to the right of the slot. Symbols display amazing animation effects and sound upon winning. The bonus symbols of this game consist of a Citadel and the background with dark clouds. Wild Bonus: The symbol of the Citadel is the wild and it substitutes all the base symbols bar the clouds. Will can appear on all reels and can come fully stacked as well. Since all wins with wild are doubled, you can easily expect to get those big and mega wins. Scatter Bonus: The symbol of the dark cloudy background is the scatter of Zeus God of Thunder slots. With three or more appearing on the reels, you get to trigger the wheel bonuses. Bonus Wheels: The green, yellow and red wheels are triggered with three, four and five scatters. Each wheel has a certain number of spins, bonus wilds and jackpots. With various exciting bonus features and stunning visuals, Zeus God of Thunder slots look no less than an epic mythological movie. You can win a jackpot of up to a whopping £100,000.